Bridgeport Kiwanis will fire up the griddle Saturday. The civic group is holding its annual Buckwheat Feed 8 a.m. to noon at the Benedum Civic Center. "This fundraiser enables our club to continue to sponsor the Bridgeport Key Club, along with candidates to Boys State, Girls State, and Hugh O'Brian Youth Leadership Camp (HOBY)," said Susan Lawrence of Bridgeport Kiwanis. "We also provide a college scholarship to a deserving BHS senior. Those are just a few of our activities." "Our mission truthfully is focused on children," Lawrence said. Cost is $8 per person with kids age 6 and under eating free. The menu includes buckwheat cakes, sausage, coffee or tea. With help from members of Bridgeport High School Key Club, more than 200 community members are served annually at the buckwheat feed. Lawrence shared some history about the event, which started in the 1950s and '60s era, when glass plants across the Bridgeport/Clarksburg area were booming with action. The buckwheat food would continue throughout much of the day, so various glass workers could catch a meal after their shift was over. It was decided to serve buckwheat cakes - rather than pancakes - because they were different. 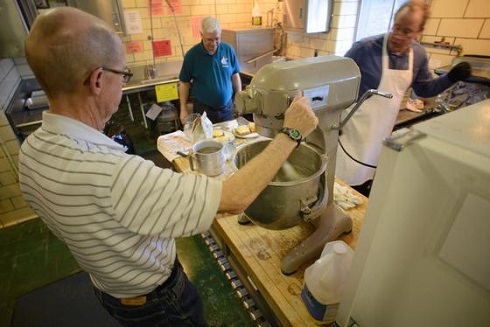 The Bridgeport Lions Club had already established its pancake feed. Buckwheat cakes would be the Kiwanis' own little niche. Seventy years or so later, it continues to be a draw, Lawrence said. One of the perks of being a member of Bridgeport Kiwanis is seeing its service-minded spirit passed down through the next generations through the Bridgeport High School Key Club, a very active group. Kiwanis serves as the Key Club's sponsor organization and BHS faculty member Kathy Cox heads up the school club. "It is the premier Key Club in the state," Lawrence said. "We have more state officers than any other Key Club in West Virginia." BHS Key Club is comprised of exceptional students, who have exceptional character, Lawrence said. "The group is very service-oriented. For years, they have gone to Meadowview Manor once a week - to play bingo with residents or take along some strings musicians. They have also done recycling projects. They come up with their own service projects and usually they are very good." Lawrence said Kiwanis is in need of additional members. Even serving temporarily while their children participate in BHS Key Club would be very beneficial, she said. The club meets the second Monday of each month at Panera Bread. Editor's Note: Photos taken by Ben Queen Photography at former Kiwanis Club Buckwheat Feeds at the Benedum Civic Center.